It’s that time of year again. There’s a distinctive chill in the air. The witches gather ‘round their cauldrons. Every shadow seems to hold some long forgotten ghost. 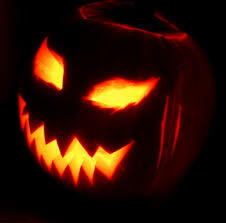 And the pumpkins just can’t seem to stop grinning. Halloween will be on us once again before long. Tales from the Cryptkeeper (1993-2000)- Tales from the Cryptkeeper was a CBS Saturday morning anthology horror show based on the very much adult-oriented HBO horror show Tales from the Crypt. That show was in turn based on the chilling and gory EC Comics magazine from the ‘50s of the same name that probably shouldn’t have been made for kids, but they read it anyway. Now that I’ve thoroughly confused you about what demographic this show was ostensibly aimed at, I’ll let you know a bit more about the show. Every episode has one or two tales of terror in it. All the episodes are introduced by the grotesque, pun-spouting Cryptkeeper with occasional interference from the Vault Keeper (originally the host of the comic The Vault of Horror) or the Old Witch (host of The Haunt of Fear). There are three episodes of this show that have some degree of fairy tale theming. Two of them use the same characters while the other is a stand alone. “The Sleeping Beauty” (S1, E6)- This episode focuses on Prince Charming (real name: Chuck) and his horse Splendor (real name: Steve) as they venture through the dark, deadly forest to awaken Sleeping Beauty. Along with them is Chuck’s nebbish, put-upon fraternal twin brother Melvin. While Chuck seemed to have gotten the good looks in the family, Melvin got all the brains. Most of the show deals with Charming/Chuck coasting through the adventure while making Melvin deal with all the hard stuff like facing the various monsters in their path. This episode seems to revel in all the various gags made about fairy tale princes. Chuck is vain, shallow, cowardly, self-absorbed and only seems to care about the princess’s looks. And Melvin is the poor sap who has to put up with it all. Needless to say, they do make it to Sleeping Beauty’s castle but there’s a bit of a twist in the works there. A twist with a bit of a . . . bite (yeah, if you know some of the usual horror twists on “Sleeping Beauty” then you probably know what it is). “The Brothers Gruff” (S2, E9)- This episode concerns a boy named Eddie Gruff who’s tired of being the lowest man on the totem pole in his family. He always seems to get in trouble and it’s usually his big brother’s fault. It doesn’t help that Eddie’s brother picks on him for believing in trolls, ogres and goblins. The real trouble starts when Eddie is forced to cross a bridge he doesn’t want to cross because he’s convinced a troll is underneath it. Just as he feared, the troll does follow him home but it’s not Eddie the troll wants. This episode is not memorable so much for drawing on folklore but for ignoring a lot of folklore and just inventing a whole lot of its own monster lore. This lore is communicated to Eddie through his friend Sheldon who “saw the movies, read the books, heard the stories”. According to Sheldon, the only way to keep a troll from following you home is bathing in vinegar, wearing a tin foil hat and wearing your mother’s housecoat with the pockets stuffed with chalk. And if you forget the chalk, then the troll can “smell your shadow”. Then, when something smears strawberry jam on the ceiling and mashes all the food in the refrigerator, Sheldon claims it’s a text book case of a troll infestation. It’s funny, with all that silliness you’d think something as simple and iconic as “turns to stone in daylight” might also make the cut. “Chuck (and Melvin) and the Beanstalker” (S2, E12)- Chuck and Melvin are back at it. Strangely, this episode acknowledges that they had gone into the deadly forest before but nothing else from the story, especially the ending. This time, Chuck and Melvin are travelling but are running low on food. So, they’re forced to make a deal with the mysterious Trader for some food. Alas, they have to trade the horse Splendor for a bag of beans. As can naturally be expected, a giant beanstalk is the result. At the top of the beanstalk, Chuck quickly puts Melvin to work trying to steal a golden harp so he can trade it for some food. The creepiest part of the story is how every creature in the giant’s castle is cyclopean. The giant himself, his cat, the mouse that infests the walls. They all have one big yellow eye. However, the big twist is that the giant isn’t the real monster of the story. The real monster is another giant creature called a Beanstalker. Honestly though, it’s just kind of a different giant so the surprise is “meh”. Technically speaking, this episode also has some perspective issues while in the giant’s castle. Are You Afraid of the Dark? (1990-2000)- Are You Afraid of the Dark? was another horror anthology show for kids. This time one originally from Canada but imported to air on Nickelodeon. The set-up this time is that a group of kids calling themselves The Midnight Society meet in the woods at night to tell scary stories around a campfire. Honestly, I like this premise because it calls back to the oral tradition, in a way. It’s kind of strange how the last kind of story we still associate with the oral tradition is the ghost story. “The Tale of the Final Wish” (S2, E1)- This episode starts off with the storyteller setting her fellow members of the Midnight Society straight about how fairy tales were really darker and scarier than most people think. They even reference some tales like “Faithful Johannes” and “Twelve Brothers”. The tale itself concerns a girl named Jill who loves fairy tales even though her friends have long outgrown them. After dealing with some grief from her brother, she clutches the book The Sandman and other Tales to her chest and wishes she could live in a fairy tale forever. She goes to sleep and wakes up in the Land of Nod, where the Sandman rules and she’s told by the Sandman that she (and her sleeping friends and family) are trapped there forever so that she can live out her fairy tale forever. As Jill tries to escape she does stumble on some other tales like Alice in Wonderland and “Hansel and Gretel”. While an okay episode it has one specific problem. Everything that the Midnight Society is talking about at the beginning sounds scarier and more interesting than what’s in the actual story. And anyone who’s read E.T.A. Hoffmann knows there are scarier takes on the Sandman. It’s understandable why this is, though. There are some things you can’t show on children’s television. But it really didn’t help that the Sandman was played by comedian Bobcat Goldthwait (think of the voice of Pain from Disney's Hercules). “The Tale of the Pinball Wizard” (S1, E13)- I’m going to include this one even though it isn’t really fairy tale based. There is a princess, witch and evil lord, though. However, the true root of this episode’s fantasy themes is classic video games like The Legend of Zelda. The story is about a kid who shirks his responsibilities to play pinball and when he finishes the game discovers that the whole mall has turned into a fantasy game like the one he was playing. It’s a fun episode and a reminder that many of the elements in fairy tales cross over into other types of fantasy. The episode does suffer from the unfortunate fact that it doesn’t seem to understand how pinball works, though. The main character keeps talking about getting to the third level. In pinball there are no levels, you just keep racking up points until you run out of balls to play with. 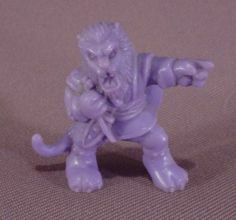 That’s right, it’s the Beast from “Beauty and the Beast”, looking very lion-ish and Cocteau-ian for a little purple toy. Well, that’s it for now. The TV shows I listed can be found on DVD in some countries and can be downloaded through some online sources (I know I got Are You Afraid of the Dark? off itunes). But this isn’t the end. We’re going to scale the age demographic up a little bit next week to look at episodes from a couple more shows. Stay tuned.